This pack of little swimming birdies know just how to celebrate the upcoming holidays! 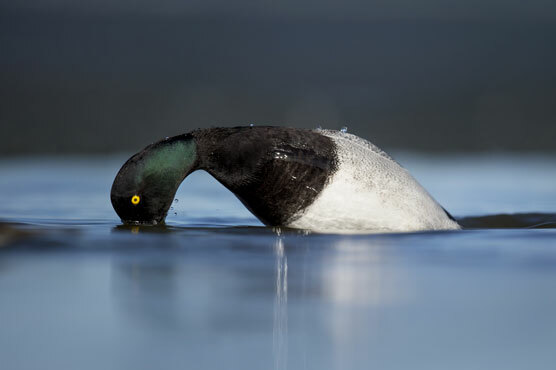 Diving Ducks: Diving ducks occur in deeper and more permanent water regions such as the Columbia River, but Washington is unique in having the presence of all five North American species during winter months. For more information visit WDFW. Happy December Solstice! and Happy Holidays to you and your family! Christmas is just a few days away now, and as we prepare for the festivities we welcome the December Solstice. So what is the Solstice anyway? In simple terms the Winter Solstice represents of the shortest day of the year. In Okanogan County the sun greeted our area at 7:48 AM this morning and will set tonight at 4:05 PM. The solstice is also is the official astronomical start of WINTER. Many people celebrate the Winter Solstice with friends and family. This year the solstice features a FULL MOON and a METEOR SHOWER! Grab a cup of cocoa, and bundle up for a dazzling night of celebration. With a light pollution level of less than 1%, be sure to look up at the night sky if you're in the area for the Solstice!